A standard video signal includes a series of regular timing "pulses" which help maintain a stable signal. In reality, recording and playback machines are not perfect and these pulses are not completely regular. Tape machines are especially prone to errors as the tape stretches or changes shape in response to differences in temperature, humidity, mechanical tension, etc. Time base errors are more common and more pronounced in cheap video tape machines. These errors usually manifest as wavy vertical lines as illustrated below. 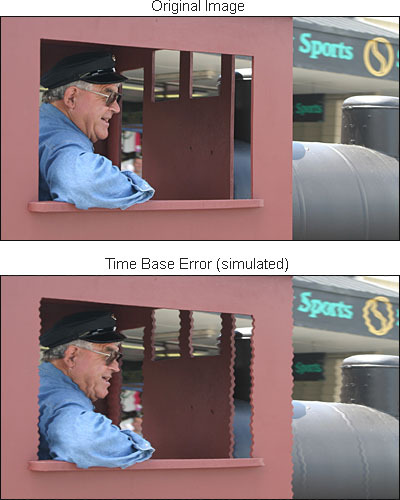 Time base errors can (usually) be fixed with a time base corrector.